Age 92, of South Webster, passed away Thursday, November 22, 2018 at SOMC Hospice in Portsmouth. He was born November 18, 1926 in Scioto County to Oscar and Ola (Hanes) Slack. Red loved cars, exercising, and spending time with his family. He was a member of Laborers Local Union #83 and also a member of Pilgrim Wesleyan Church in South Webster. He was well loved by his many friends at Hillview. 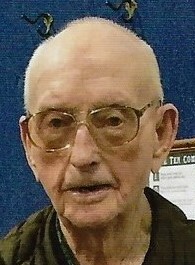 He is survived by his grandchildren, John Slack and Shellie Rae Scott; brother, Pearl Slack of Zanesville; several nieces and nephews. In addition to his parents, he was preceded in death by his wife, Belma (Triggs) Slack who he married on April 5, 1947; son, James “Jim” Slack, Jr.; daughter, Lorena Jean “Jeannie” Slack; brothers, Gerald Hanes and Arva Slack. Funeral services will be 11:00 a.m. Monday November 26, 2018 at D.W. SWICK-NELSON FUNERAL HOME in South Webster with Pastor Paul Hagen officiating. Interment will follow at South Webster Cemetery. Friends may call on Sunday from 4 – 7 p.m. and one hour prior to the service on Monday. Fond remembrances and expressions of condolence may be shared at www.DWSwickNelsonFuneralHome.com. Memorial donations in Red’s name may be made to SOMC Hospice in Portsmouth.